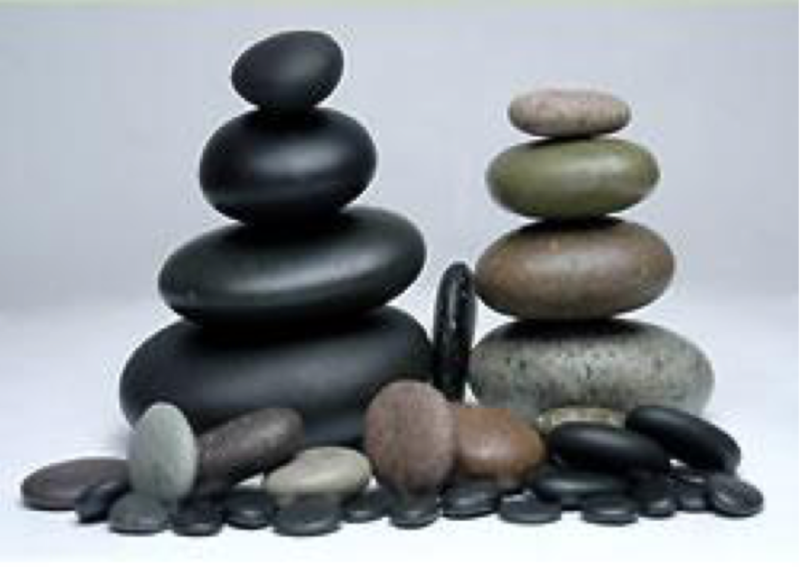 The use of smooth dark igneous basaltic stones for massage tools has been well received by almost all of my clients. I heard about and read about the use of these stones. The idea was like another "drum roll" in the many facets of my life. I gathered the stones, with permission, mindfully, on sunny days when it was wonderful to be on the intertidal zone of a private cobble stone beach on our island. Some were medium, rounded and just fit in my hand. Others were kidney shaped, oval, knobbed or in some manner looked or felt useful for working on a body. A massage friend showed me a few things to do with them, I found a second hand electric roasting oven and then I just experimented and practiced. I took one western stone class that used a lot of layouts, stones too hot or too cold, etc. It was "not my cup of tea", and as we say here, "did not float my boat." I am still fine tuning the use of these warmed stones for gliding and compressing. Need often teaches me new ways to help people with them. Besides heating stones for therapy, I sometimes use cool smooth stones, with quartz, in room temperature cool water, for contrast therapy with the warm stones, if massaging around muscle inflammation. People laugh when I tell them that I have not worn out any of these helpful tools yet. Unless being asked for the Lomi Lomi Pohaku Welawela Hawaiian Hot Stone Massage, (learn more...), the use of Maine Warm Stones can be requested and made a part of any of the many massages that I integrate for my clients. There is no extra charge for the Maine Warm Stones. My studio is well set up for this. Properly warmed, handled and tended, the even pressure and heat of the stones just plain feels good and makes the client feel better. I love hearing clients say, during or at the end of a session, "I love those stones!" Of note, for some, is the fact that oil and warm stones on a hairy chest, back or legs, remove the ouch of pulled hair.